I live in big city, ND and I love it! I love that the grass is green (and that there is lots of it)! Green grass, but for the most part ND is not into LIVING GREEN! 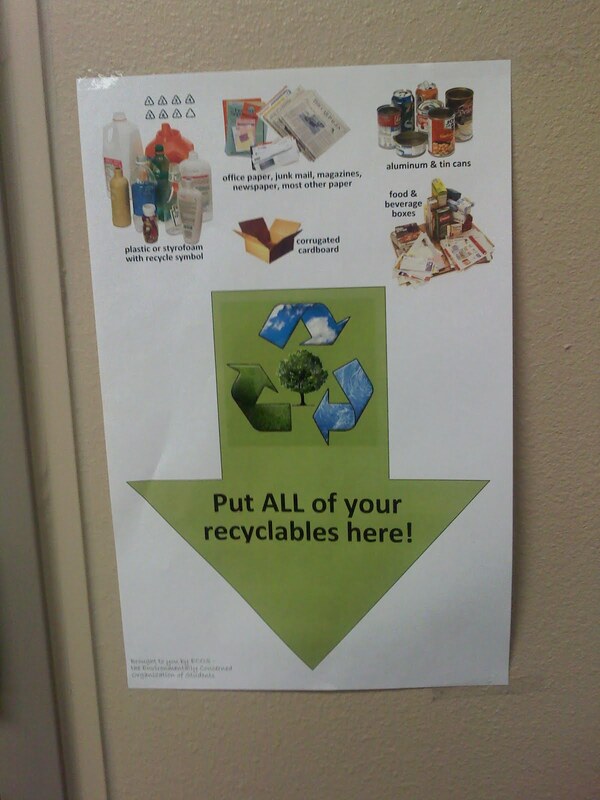 Unfortunately, it appears to me that North Dakota communities overall haven’t gotten the recycling bug. At least this is my perception of the situation. I have friends who recycle. I have friends who gather, clean, and haul. I have friends (including Ethne) that live in the great state of Minnesota—Minnesota is way ahead of the game when it comes to recycling. Just one of the signs hanging on my College campus (where I work). Luckily my employer supports it! I live in a state that is economically STRONG. Our unemployment rate is extremely low and we are thriving (unlike many other states). 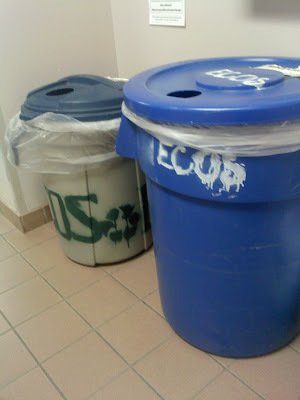 However, we can’t afford recycling? Strange…isn’t it?!? 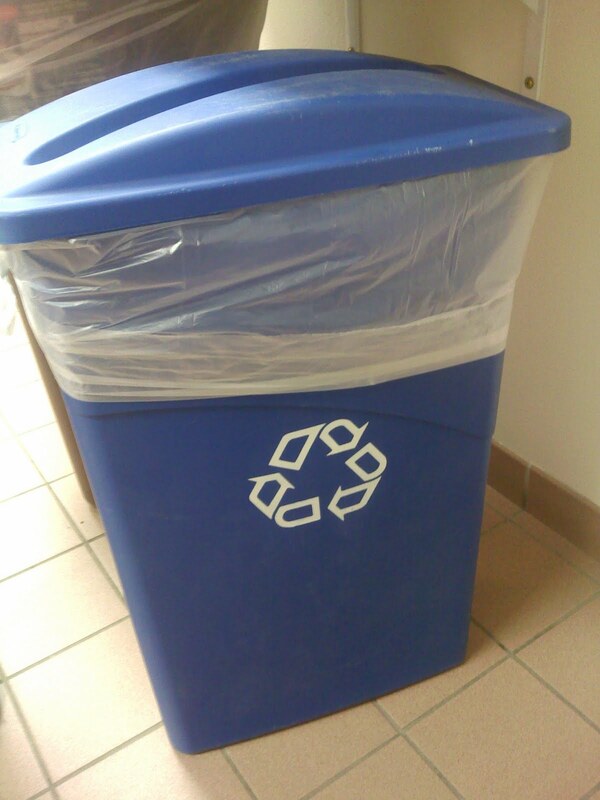 We can’t recycle to prepare for our kid’s future. (Don’t get me wrong—I am sure there are some cities that are into recycling. I don’t mean to stereotype every ND City into this category, but my experiences with recycling have been negative so far). But guess what? My big city, ND town is doing something about this. I attended a curbside recycling meeting last night and it looks like we may FINALLY get with it! The cost: just under $5.00/month for every household. I can think of the things that I spend $5.00/month on and I am convinced that making my Mur-Man’s future stronger is a good use of $5.00 a month. I AM SOLD! I AM COMMITTED! So followers: Convince your communities to get on board. Convince your communities to not add to the landfill. DO IT! WOMS—WE CAN GET THINGS DONE! MOUTHWATERING MONDAY: DON'T GET SAUCY! THIS SHOWER WAS A HOOT! WTF: WAY TOO FUNNY (every emotion)! TOGETHER AGAIN: St. Paul Strategy! DOUBLE-HEADER FRIDAY: COUPON BINDER USER! DOUBLE-HEADER FRIDAY: FOLLOWER COUPON SUCCESS!